Michelle Bailat-Jones has written a beautiful novel called Fog Island Mountains. I’ve just posted a review of it here. 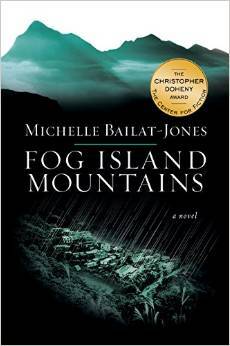 The novel won the 2013 Christopher Doheny Award and I hope it goes on to sell, and so to affect, many many readers. It deserves to because it deals with the most serious event in our lives with eloquence, compassion, honesty and delicacy. The term Bailat-Jones gives her protagonist for his cancer is everywhere … something that can neither be contained nor cured nor properly understood, just coped with. But this is definitively NOT a depressing novel: I urge you to read it: you can find copies here. And the thing I would like to have done this month, in a parallel universe where time is infinite and all things are possible, is linked by subject matter to Fog Island Mountains: I would like to become Dr Atul Gawande because his series of Reith Lectures are extraordinary for their depth of understanding of the way medicine is practised – at least in the Western world – and for his compassion for the people whose cases he uses to illustrate his lectures. He embeds a personal story in each lecture and so we discover the things Gawande thinks medics get wrong through the palpably personal experience of one individual. The lecture broadcast on Radio 4 on Tuesday 9 December was about the medicine, treatment and care of the dying and how we’ve spent, in Gawande’s words: ‘Fifty years medicalising mortality and it hasn’t worked’. It used to be that we died at home; now most of us die in institutions and that isn’t good for us or for our families. Obvious, obviously … but the reason it happens, Gawande thinks, is that doctors ask the wrong questions and they talk too much. They should talk less than fifty percent of the time (Gawande discovered he talked ninety percent of the time when giving diagnoses) and doctors should ask questions of their patients, because the only way to discover what a person really wants is to ask. (Families can ask the questions too.) The answers to the questions Gawande now asks can make a patient’s final days as painfree as possible and more peaceful, even happy. In the case of the patient he talked about in Tuesday’s lecture, a piano teacher, after she’d answered his questions she was able to leave hospital (where the chemotherapy was actually making her condition worse) and give classes, hold concerts for her students and give them each a few words of wisdom and encouragement before she died. ‘When you focus on what’s worth living for,’ says Gawande, ‘you can live better and longer, for a while.’ Hospice nurses, Gawande says, focus on making each day the best day possible for the patient. But this is the opposite of medical thinking, which is to make a medical intervention that usually makes things worse, at least to begin with, even though it’s likely to make for a better future: but many people in the final stages of life die in surgery, their last day on earth is spent on the operating table. So doctors’ attitudes, at this stage of life, need to change. A remarkable man … may his compassionate ideas find their way out into the world: everywhere. This entry was posted in Death and Dying, Literary Prizes, Things I'd Love to Have Made, Writers. Bookmark the permalink. Isn’t it a reminder too, that we should remember to live, ie really live our days now rather than in some wonderful future? So much more difficult than it seems written down. Living for others (perhaps especially for women?) is such a temptation and it isn’t always the kindest or wisest way – speaking/writing as someone who has always done just this and is paying the cost. Yes it is, Carol. But it is so much more difficult to do than to write, just as you say. It seems to me the best we can do is remember to live our days at least some of the time (I think it’s an impossibility all the time) and I so agree about – perhaps especially women – living for others. But if we can shift the way we live to what we’d probably think of as more ‘selfish’ ie, paying more attention to ourselves than to others some fo the time too, then we’ll feel less put-upon and, conversely, also make better carers when called on.